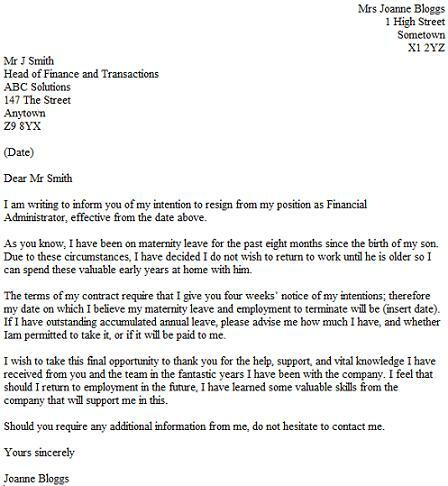 You can use this letter for resigning after you have been away from work on maternity leave. You should of course amend the letter to suit your own situations before using it. I am writing to inform you of my intention to resign from my position as Financial Administrator, effective from the date above. As you know, I have been on maternity leave for the past eight months since the birth of my son. Due to these circumstances, I have decided I do not wish to return to work until he is older so I can spend these valuable early years at home with him. The terms of my contract require that I give you four weeks’ notice of my intentions; therefore my date on which I believe my maternity leave and employment to terminate will be (insert date). If I have outstanding accumulated annual leave, please advise me how much I have, and whether Iam permitted to take it, or if it will be paid to me. I wish to take this final opportunity to thank you for the help, support, and vital knowledge I have received from you and the team in the fantastic years I have been with the company. I feel that should I return to employment in the future, I have learned some valuable skills from the company that will support me in this. Should you require any additional information from me, do not hesitate to contact me.